The Sacred Page: Phoenix Rising to L.A.: Will it be Bishop Olmsted? Phoenix Rising to L.A.: Will it be Bishop Olmsted? Apparently, I'm not the only one thinking Bishop Olmsted may get the papal nod. Thomas Peters, a.k.a., the American Papist, is likewise discussing the prospect of a "Phoenix-Rising to L.A." I am grateful that he mentioned my posts on the potential papal picks (part one, part two), which he kindly described as providing "a withering amount of information". In the end, only time will tell if Bishop Olmsted becomes the successor to Cardinal Mahony. It's really anyone's guess who the next archbishop of L.A. will be. However, I hasten to add that my speculation wasn't simply based on flights of fancy. What I tried to do is offer an "educated" guess, devising a careful methodology with criteria for my speculation. Instead of simply looking at high profile ecclesiastical figures I tried to focus my attention on those already identified as likely candidates. I also noted that Rocco apparently has some inside information that the list of the final three names is split between Anglo and Hispanic names. My speculation was based on this and proceeded as follows. First, I looked at the leading Hispanic prelates in America who have all been rumored to be under consideration for the job. Second, I tried to offer an in-depth analysis of the Holy Father's latest episcopal appointments in the hopes of identifying the characteristics of a Benedict large-see Ordinary. As I explained, unless the pope picks a Latino, it seems to me Bishop Olmsted emerges as the likely candidate. 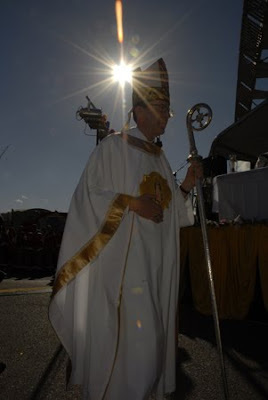 Not only has he had experience running a major diocese with a large Hispanic population, he also seems to possess the kind of curriculum vitae Pope Benedict looks for in his major appointments: (1) experience in priestly formation, (2) a Roman background, (3) an academic background, etc. Other names might be mentioned, but if we limit our speculation by focusing on the pope's recent track record, it seems to me--and I wish someone else would do a similar analysis--Bishop Olmsted emerges as the front runner. Still, again, it's anyone's guess. And I'm confident that the Holy Father will do a better job picking a shepherd than I would! Finally, I might add that if Bishop Olmsted does get the job, I'll be curious to see how many writers (if any) use my "Phoenix-Rising" blog heading to announce the news. Note the time stamp here: February 15, 2010--it was used here first! As one of those who came over from AmericanPapist to see what had been written here, you can rest assured that I quickly added your blog to my Google Reader subscriptions. I've been very impressed so far! Great! Thanks so much. It's good to have you aboard! We had d the fortune of having Fr. Olmstead say mass at our parish many times while he served the local Josphenium seminary. We new from the first homily .... this is a chosen man with whom God is well pleased!